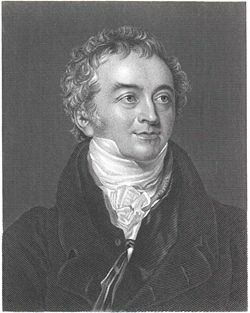 Thomas Young (June 13, 1773 - May 10, 1829) was a British polymath, a scientist who conclusively demonstrated many of the wave properties of light. He also made a number of other contributions in physics and medicine, and was the first to decipher some of the Egyptian inscriptions on the Rosetta Stone. He had a brilliant mind and exceptional intellect, which he used to investigate a wide variety of areas in order to understand topics such as eyesight, light, languages, and other such topics beneficial to humankind. He also made a large number of contributions that were published in Encylcopedia Britannica, increasing the depth and breadth of knowledge available to all. Yet, Young was not well recognized in his lifetime, with many of his discoveries not being recognized until years later. Thomas Young belonged to a Quaker family of Milverton, Somerset, England, where he was born on June 13, 1773, the youngest of ten children of Thomas Young, Sr. and Sarah Davis. He is said to have learned to read at age two under the tutelage of his maternal grandfather. He began school at age six in Bristol, and at the age of eight, took an interest in surveying, which he learned from a neighborhood friend. From age nine to fourteen, he attended a school at Compton in Dorsetshire, and achieved a command of Greek and Latin and was acquainted with French, Italian, Hebrew, Chaldean, Syriac, Samaritan, Arabic, Persian, Turkish, and Amharic (Singh 2000). In his youth, he detested the enslavement of Africans, and as a result, refused to consume sugar produced under conditions of slavery. While at Compton, he made strides to imitate the success of others, feeling that no man is inferior to another. For example, in equestrian sports, he failed in his first two attempts to leap over an obstacle that he saw another rider sail over with his steed, but on his third attempt, cleared the obstacle without trouble. This sense of persistence enabled him to challenge and conquer the many subjects he investigated. He developed a strong interest in biology. In order to more closely examine the parts of plants, he built himself a microscope, for which he taught himself advanced mathematics in order to understand manuals that described the instrument. After leaving Compton, he studied in Youngsbury under a private tutor, where he excelled in classical Greek literature. His talents being obvious to members of the British aristocracy, he was offered a career in public administration, but turned it down. Young began to study medicine at the Hunterian School of Anatomy in London in 1792, moved to Edinburgh in 1794, and in the same year wrote a paper on the manner in which the eye achieves focus, earning him membership in the Royal Society of London. In 1795, he studied in Göttingen, where he obtained the degree of doctor of physics, and in 1797, enrolled in Emmanuel College, Cambridge in preparation for his entry into the College of Physicians in London. In the same year he inherited the estate of his grand-uncle, Richard Brocklesby, which made him financially independent, and in 1799, he established himself as a physician at 48 Welbeck Street, London (now recorded with a blue plaque). Young published many of his first academic articles anonymously to protect his reputation as a physician. However, his actual medical practice is said to have been rather limited, due to Young's exacting intellect and his fear that inadequate medical knowledge might lead to the wrong or improper treatment to the detriment of the patient's health. The Latin initials with which he disguised his name in the papers he published were said to be known among his friends and associates, and he later abandoned the practice of shielding his name altogether. In 1801, Young was appointed professor of "natural philosophy" (mainly physics) at the Royal Institution. In two years he delivered 91 lectures. In 1802, he was appointed foreign secretary of the Royal Society. He resigned his professorship in 1803, fearing that its duties would interfere with his medical practice. His lectures were published in 1807 in the Course of Lectures on Natural Philosophy and contain a number of anticipations of later theories. On June 14, 1804, Young married Eliza Maxwell, an intelligent woman who understood and supported Young's work throughout his life. Young enjoyed a lively social life. He often dined with the most august company in London, and, busy as he was, easily communicated with the great minds in his social circle. He was well-respected, if not always well understood, and managed to avoid controversy, particularly as he feared the effect it might have on his medical practice. Although his wife gave him no children, Young was very much involved in the lives of his in-laws, particularly his wife's sisters, with whom he often corresponded, and from whom he derived much inspiration for his activities. While he was a man given great advantages by birth, he also fully earned the honors bestowed upon him. His intellectual activities were the stimulus that gave meaning to his life. In 1811, Young became physician to St. George's Hospital, and in 1814, he served on a committee appointed to consider the dangers involved by the general introduction of gas into London. In 1816, he was secretary of a commission charged with ascertaining the length of the seconds pendulum (the length of the suspending cord required for a pendulum to achieve a back and forth sway of exactly one second), and in 1818, he became secretary to the Board of Longitude and superintendent of the HM Nautical Almanac Office. Part of this task was editing the Nautical Almanac. The production of this work became embroiled in controversy, as a number of scientists began to criticize the manner in which it was composed, and the accuracy of some of the figures contained in it. While its audience was originally the British Navy, there were those who thought it should be upgraded to a general astronomical work available to the public. The board itself could not agree on this matter, and in 1828, it was disbanded by an act of of the British Parliament. Young, however, was asked to assume the same responsibilities that he had undertaken while secretary. In spite of his accomplishments, Young encountered some disappointments in his life. He was never satisfied with his life as a physician, feeling that he fell short of what the profession demanded. As demand for his medical services fell, he was forced to find other sources of income. A few years before his death, he became interested in life assurance, and in 1827, he was chosen one of the eight foreign associates of the French Academy of Sciences. In the latter part of his life, he devoted his leisure to work on deciphering Egyptian hieroglyphics, and at the time of his passing, was at work on a dictionary of hieroglyphics. Thomas Young died in London, on May 10, 1829, of an aortic blockage. Young's first submissions to the Royal Society consisted of studies on eyesight. He was able to determine that the ability of the eye to focus on images both near and far was due to muscles surrounding the lens of the eye that changed its shape and therefore its focal length. He also developed a theory, later taken up by the physicist Hermann Von Helmholtz, that ascribed color vision to three types of receptors in the eye, each with a sensitivity to only one of the three primary colors. It was not until the twentieth century that this theory was confirmed. Young's first paper on light, read to the Royal Society in 1800, focused primarily on the difficulties in explaining various phenomena from the viewpoint of the particle theory. Papers submitted to the society in 1802 and 1803, more clearly pointed to evidence supporting the theory that light is a wave, and not a particle. Young's idea was simple. If light propagates like a wave, such as a wave in water, or a sound wave, then when two of the waves meet so as to reinforce each other, the light will be brighter. But if, as in other waves, they meet when the low point of one and the high point of the other coincide, the waves will interfere with each other and blot each other out. Young did various experiments to show that this was indeed the case with light, the most famous of which was the passing of light through an opaque surface with a double slit to allow two beams of light to pass. Young argued that the resulting pattern of light and shadow produced by the two combined light sources demonstrated that light was a wave. He also explained the colors found at the fringes of shadows by the interference of waves, which blot out some colors of the white light, leaving other colors of the spectrum intact. In the same way he explained the colors produced when two glass plates come into contact, and many other situations that produce colored fringes, including the rainbow, as due to the wave character of light. In 1807, Young published still another account that more clearly elucidated the wave theory of light and its applications. Young's theories were virtually ignored, in part because the famous scientist Pierre-Simon Laplace supported a particle theory to explain the same phenomena, and his reputation was such as to stifle the reception of any opinion that differed from his on such an important subject. The English Royal Society was also reluctant to consider any approach that was not based on the theories of Sir Isaac Newton. However, Augustin-Jean Fresnel's paper describing the same phenomena, and submitted in 1815, to the French Academy of Sciences, startled members of the society, who had evidently not noticed Young's contribution. A team of scientists, including Francois Arago, was charged with investigating Fresnel's paper, which appeared to them to break new ground. They met with Young, and praised Fresnel's paper in his presence. Young then insisted that he had arrived at the same conclusions many years earlier and had reported them to the Royal Society. The team of scientists was skeptical, but Young's wife, who was present at this meeting, produced a volume in which Young's conclusions had been printed some years earlier. This led to Fresnel's first paper on the subject receiving less notoriety, although it did have the effect of putting the spotlight on the wave theory of light and Young's accomplishments. Only three years later, Fresnel would improve upon Young's discoveries with dramatic new evidence for the wave theory. Young was interested in other fields of physics, including the motion of bodies and the properties of materials. He developed a measure, now called "Young's modulus," which helps engineers and scientists measure the elasticity of materials. In physiology Young made an important contribution to haemodynamics in the Croonian lecture for 1808, on the "Functions of the Heart and Arteries." His medical writings included An Introduction to Medical Literature, including a System of Practical Nosology (1813), and A Practical and Historical Treatise on Consumptive Diseases (1815). Young was interested in the evolution of language groups, and divided the world's languages into five major families: The Monosyllabic, the Indo-European, the Tataric, the African, and the American. His thoughts on this subject were published in an article for the Quarterly Review in 1813. Based on work by German philologist Johann Christoph Adelung, Young made a comparison of the words for "heaven," "sky," and "earth" in more than 400 different languages (Peacock, 1855) believing that these words would exist in all languages and would be the least likely to experience change. Young was not the first to promote the study of language families, although he did coin the name "Indo-European" to refer to the major European language group. Young's research into the meaning of Egyptian hieroglyphs was sparked by the discovery of the Rosetta Stone, upon which is inscribed the same basic text written in Greek, demotic, and hieroglyphics. Young was one of the first who tried to decipher hieroglyphics, building on the work of the French scholar Silvestre de Sacy and the Swedish diplomat J.D. Akerblad, who had already built up a demotic alphabet of 29 letters. But Akerblad incorrectly believed that demotic was entirely phonetic or alphabetic. 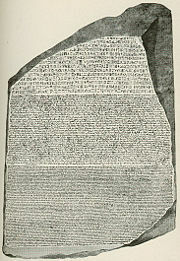 By 1814, Young had completely translated the "enchorial" (demotic, in modern terms) text of the Rosetta Stone (he had a list with 86 demotic words), and then studied the hieroglyphic alphabet but failed to recognize that demotic and hieroglyphic texts of the Rosetta Stone were paraphrases of the Greek and not simple translations. In 1823, he published an Account of the Recent Discoveries in Hieroglyphic Literature and Egyptian Antiquities. Some of Young's conclusions appeared in the famous article "Egypt" he wrote for the 1818 edition of the Encyclopædia Britannica. Whether he (Champollion) made this discovery before I had printed my letters in the Museum Criticum in 1816, I have no means of ascertaining. I have never asked him the question, nor is it of much importance either to the world at large or to ourselves. It may not be strictly just to say that a man has no right to claim any discovery as his own till he has printed and published it, but the rule is at least a very useful one. Champollion, however, was unwilling to share the credit. In the forthcoming schism, strongly motivated by the political tensions of that time between England and France, the British supported Young and the French Champollion. Champollion, whose complete understanding of the hieroglyphic grammar was achieved in part through better access to examples of early Egyptian documents, showed the mistakes made by Young and maintained that he alone had deciphered the hieroglyphs successfully. This rift was partially healed when Champollion offered Young access to demotic manuscripts in the Louvre, when he was curator there. Specifically, Young appears to have been the first to demonstrate that inscriptions enclosed in rings or ellipses contained the name of Ptolemy. He also identified some of the symbols as relating to the feminine gender, and recognized part of the name "Cleopatra" on the stone. In order to accomplish these partial translations, he formulated a list of hieroglyphs that he believed were phonetic. Young was an early contributor to the Encyclopedia Britannica. He wrote articles on music, fluid mechanics, and languages, among other subjects, but in 1814, frustration over the treatment of one of his submissions caused him to turn down a request for articles. Two years later, however, he warmed up to the idea again, partly because his medical practice no longer supplied sufficient means for the support of his family. Between 1816 and 1823, he wrote more than 60 articles for the encyclopedia's supplement, of which more than two thirds were biographies. He received 16 guineas a page for his work published anonymously, and 20 guineas where his name was given as the author. Most notable among the biographies were those of Henry Cavendish, which included a detailed examination of his contributions to science, and Joseph Louis Lagrange, whose prolific researches he attributed more to industry than to innate genius. Young was fond of listing the works of each of the subjects of his biographies, with commentary of those of the greatest importance. Other notable topics on which he wrote, besides his famous contribution, "Egypt," included his articles "Cohesion," "Tides," and "Chromatics." Many of his articles were based on his previously published work. Thomas Young will always be remembered as a major contributor to the study of light. He was the first to pin down the characteristics of light that could be ascribed to its properties as a wave, and to rigorously test for these. He coined the word "interference" to describe the manner in which the intensity of light would be augmented or diminished when one wave overlapped another. This was a major breakthrough, although its impact was not felt until the later discoveries of Fresnel. Young's suggestion that light waves had a transverse component, taken up and perfected by Fresnel, were important in the identification of light as an electromagnetic phenomenon by James Clerk Maxwell in the 1860s. His explanation of color vision was far ahead of its time, and laid the foundation for other investigators, including Hermann von Helmholtz and Maxwell, the latter having produced the first color photograph by using filters for the three primary colors. Color printing also has its origin in the three-color theory, but these innovations would not come until more than a century after Young's contribution. In the translation of hieroglyphics, Young directed his entire battery of the powers of his mind, but lacked the full resources he needed to completely succeed in his undertaking. He was thus outdistanced by Champollion, and probably lost many other battles as well, distracted as he was by so many diverse interests. While he was obviously disappointed that Champollion did not recognize his contributions, Young always held the moral high ground by showering his opponent with compliments. Because he was spread thin by his many interests, his contributions were limited to one or two that successfully caught the attention of the communities to which they were addressed. Enjoying financial independence for much of his life, Young was able to indulge in whatever subject fancied his curiosity. Perhaps this is one reason why he dabbled in so many fields. His legacy may be more his driving personality and his tremendous intellect than any of the individual discoveries he made. He also realized that scientists on the continent were far more apprised of his work than those in his own country, and lamented that he had not received the recognition that he felt he deserved. Added to this was the disappointment in his medical practice, which in later years failed to bring in enough business to support his family. Young also must have also been disenchanted with the medical profession on philosophical grounds, as the modes of treatment for patients were of an arbitrary nature and full of risk. He sought comfort through challenging investigations in areas where the work of intellect could yield conclusions of far greater certainty and with fewer tangible repercussions than in the medical field. Later scholars and scientists have praised Young's work although they may know him only through achievements he made in their fields. His contemporary Sir John Herschel called him a "truly original genius." Albert Einstein praised him in a 1931 foreword to an edition of Newton's Opticks. Other admirers include physicist John William Strutt (Lord Rayleigh) and Nobel laureate Philip Anderson. Young, Thomas. 1855. Miscellaneous Works of the Late Thomas Young, M.D., F.R.S. (3 volumes). John Murray. Young, Thomas. 1856. The Christian Remembrancer: A Quarterly Review. London: C.& J. Mozley. Arago, F. 1859. Biographies of Distinguished Scientific Men. Boston: Ticknor and Fields. Whewell, William. 1858. History of the Inductive Sciences from the Earliest to the Present Time. New York: D. Appleton and Co. Reluctant polymath by PD Smith in The Guardian, January 20, 2007. This page was last modified on 4 December 2015, at 16:57.